Bryan’s ALL ROAD ELITE is a Dark Horse! Ben over at Horse Cycles Paint killing the finish. Bryan wanted to incorporate something unique into the design of the finish and he gave us this amazing optical graphic called the Zollner Illusion. Basically a number of parallel lines with hashmarks striking through each line. The illusion is the parallel lines look angled. 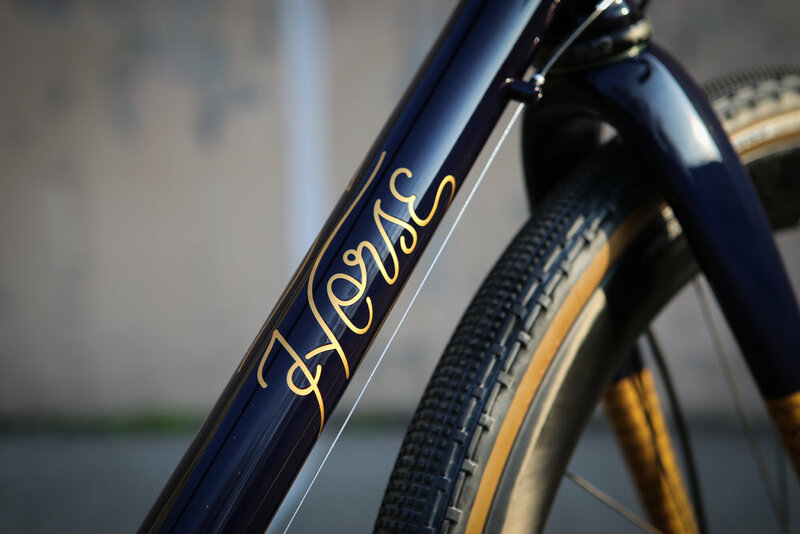 The deep dark navy blue and bright metallic gold make this bike both a dark steed and a shining stallion. 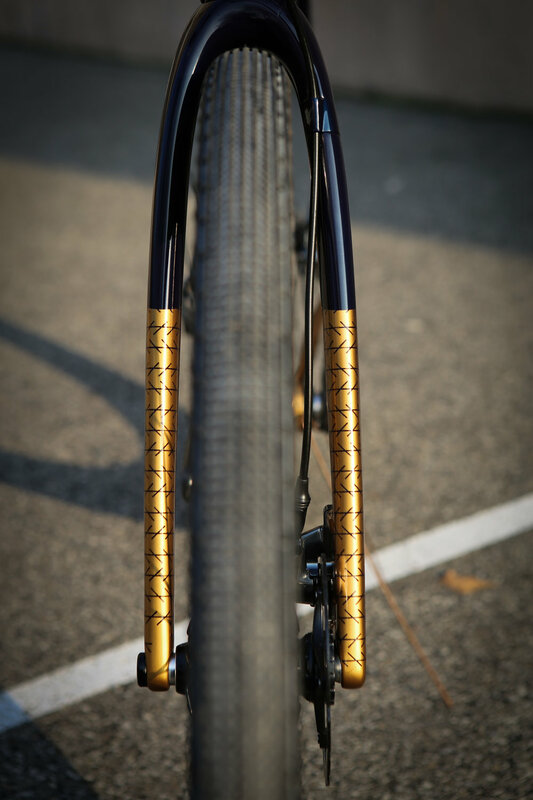 The build is also one to Enve. The Wheels that drive this rig are the new ENVE SES 4.5 AR DISC wheels. Because this bike will be used as a 70% /30% road to gravel we chose a stiffer wheel for grater acceleration when riding on tarmac. The I9 hubs give it the engagement of the highest end mountain wheel for technical climbing on the trail. Paired with the Panaracer gravel kings make this wheel set up perfect for the Bay Area riding Bryan is after. 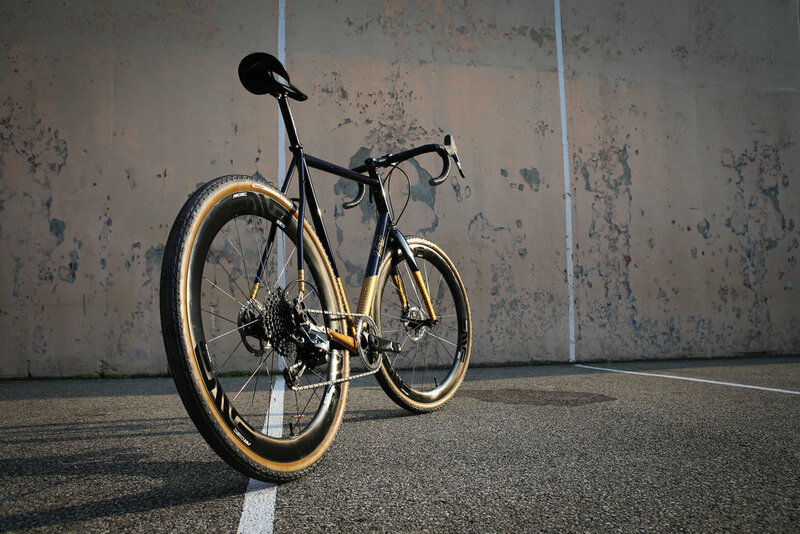 The Chris King Matte Jet headset, Thomson seat post and x4 stem, brooks carved C15 saddle and a full Sram Force Group compliment the frame making it a capable Rig on and off the trail. Keep your eye out for a twinkle in the Bay Area and in the Berkley hills outside of Oakland, CA.